Selecting and preparing the required sand and gravel for a biosand filter is crucial for the treatment efficiency of the biosand filter. Note: The content on this page has been adapted from publications of the Centre for Affordable Water and Sanitation Technology (CAWST). 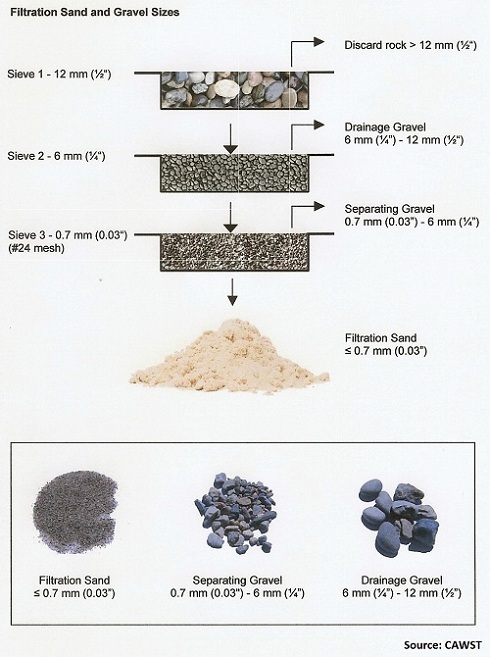 While not complicated, the steps in locating and preparing the needed sand filter media and gravel must be followed exactly as presented. 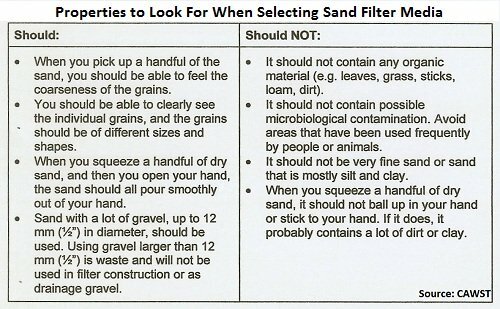 Poor selection and preparation of the filtration sand could lead to poor performance and a considerable amount of work to rectify the problem. Crushed rock is the best type of filtration sand since it has less chance of being contaminated with pathogens or organic material. Grains of sand that have been shaped by water (i.e., river sand and beach sand) are rounded and uniform in size. Crushed rock, on the other hand, produces sand grains that are course, with jagged edges, and not uniform in size. Rounded sand grains of uniform size, when packed together, do not produce pore spaces small enough to be effective as sand filter media. Crushed rock sand grains, when packed together, fit like puzzle pieces. Their varied sizes and jagged edges produce tiny pores small enough to filter out pathogens found in water. Gravel pits or quarries are the best place to obtain crushed rock, and are common in most parts of the world. You can also ask local construction, road work, or brick manufacturing companies to find out where they get their source of crushed rock. At first, quarry rock may not seem proper for sieving due to the large amounts of dust. You can select the rock load and the crusher properly to ensure that large chunks of rock and dust are minimal. Often, you can even sieve the load at the quarry site and only pay for what you take. This greatly reduces waste and the cost. Crushed rock may be difficult to locate, more expensive, and require transportation to your production site. However, it is critical in providing the best water quality and is worth the extra time, effort and cost. If crushed rock is absolutely not available, the next choice for sand filter media is sand from high on the banks of a river (that has not been in the water), followed by sand found in the river bed itself. The last choice is beach sand. River sand is usually contaminated with pathogens (from human and animal excreta) and contains organic material (e.g. leaves, sticks). Putting contaminated sand in the biosand filter may actually result in worse water quality than in the original source water. This happens because the organic matter is a food source for pathogens and helps them to grow and multiply in the filter until all of the food is consumed. River sand needs to be disinfected and the organic material removed if it is going to be used as sands filter media. You can disinfect the sand by using chlorine or placing it in the sun. Disinfection will kill the pathogens; however it will not remove all of the organic material. This can only be done by heating the sand to very high temperatures to burn off the organic material. This process is very costly, time consuming and not practical in most situations. For these reasons, it is better to spend your time and money to find a source of crushed rock that provides the best sand filter media and the best water quality. Beach sand usually contains salt, organic material and other contaminants that will dissolve into the filtered water. You will need to flush the beach sand with fresh water to remove the salt. Also, you will need to disinfect the sand to kill the pathogens and then remove the organic material using a similar process as described previously for the river sand. Once a suitable source of crushed rock has been found, it must be sorted. This is done by sifting crushed rock material through a series sieves. Sieves are usually metal wire screens attached to a wooden frame. Gravel and sand is sifted through progressively finer screens and sorted into piles according to size. Each size of material serves a specific purpose in the construction of the biosand filter. 1. The sand must pass through a 12mm (1/2”) sieve. Anything larger than this can be discarded. 2. Store the material that is captured by the 6mm (1/4”) sieve. This is used for the drainage gravel layer at the bottom of the filter. 3. Store the material that is captured by the 1mm (0.04”) sieve. This will be used for the separating gravel layer just on top of the drainage gravel layer. 4. Store the material that is captured by the 0.7mm (0.03”) sieve. Part of this material will be used to make the concrete filter box (if constructing a concrete filter). The rest will be further sifted to make the sand filter media. 5. The material that passes through the 0.7mm (0.03”) sieve is thefiltration sand that goes into the filter. Return to "Biosand Filters" from "Sand Filter Media"